1. 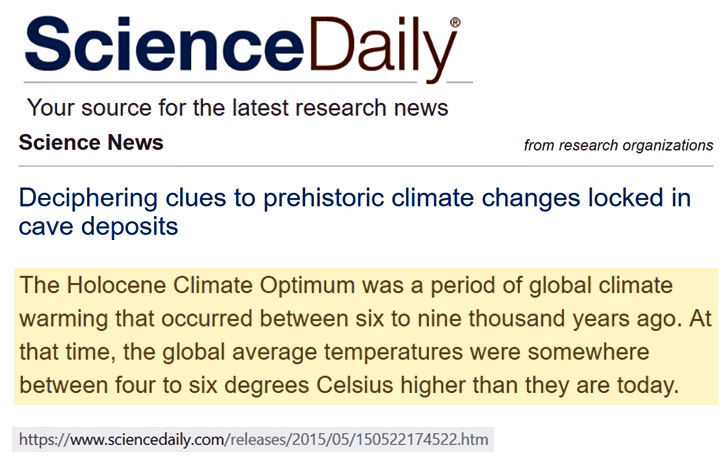 On the earth climate is changing hundreds times with ~90,000 years of global cooling and ~20,000 years of global warming.It is not linear process, when conditions on continents are playing the biggest role. – As lighter than most gasses in air they help lift to upper troposphere any volume of air, where water vapor in number bigger, than in other volumes. – Clouds, which cover 1/3 of the earth surface reflect back to space direct sun radiation, the same are doing snow and ice. 3. Beginning from 2000 killer beetles destroyed more than 100 millions of acres of forests in West of the USA and Canada. 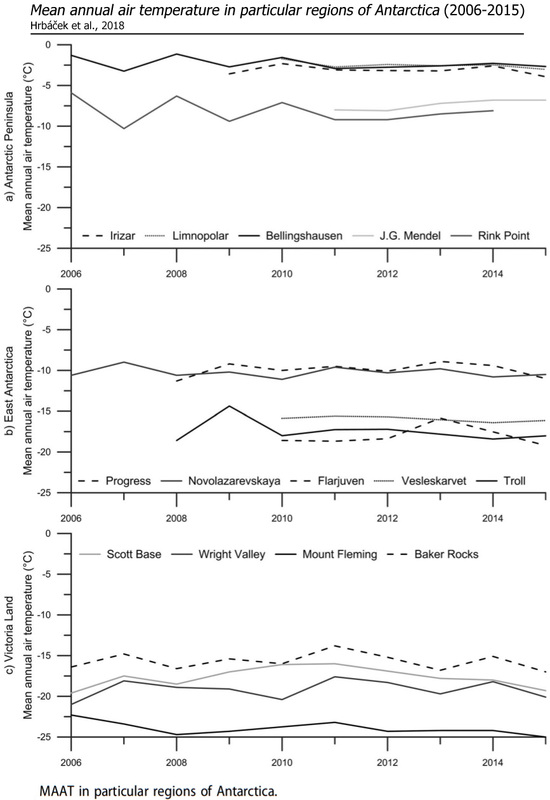 If trees in alive forests contain millions tons of water, which in winter time is playing role of thermostat for changing temperature – dead dry trees created huge corridor from Arctic to the south of west dead trees area. It created huge winter Arctic Vortex in North America today. 4. If scientists of climate change today will play attention on realities on the ground, but on their stupid theory, that greenhouse gasses are playing any role in nature WE LONG AGO can reduce disasters from weather and climate: droughts, wildfires, flooding, huge snowfalls, tornadoes, thunderstorms. WE MUST REEVALUATE DEADLY WRONG SCIENCE OF CLIMATE CHANGE AND SEND ALL SCIENTISTS, WHICH BLAME GREENHOUSE GASSES, TO RETIREMENT. May also be enhanced by the solar minimum, since we’re back down to the solar activity conditions last seen in 2010. In 2010 we had the Moscow heat wave due to jet stream blocking, and also a very cold winter in the UK. The latter was due to solar activity according to solar scientist Mike Lockwood (who is an IPCC lead author, not a climate sceptic). So the one thing that’s pretty sure is it isn’t due to CO2, because you would in that circumstance see a smooth increase in events, not episodic each 11 years or so. The start of this current warming was when a Sudden Stratospheric Warming (SSW) start to appear over the pole at about 15km above the earth’s surface, in the last weeks of December. This is the second SSW this year, the last one was back in February/March. SSW are common in the NH during solar minimums and have happened many times before. This is off topic, but has some remarkable parallels to the subject of No Tricks blog. Out of an article at Zero Hedge today discussing MSM and alternate media. “We in Alt-Media are confident the truth will eventually come out despite the efforts of the ruling elites and their MSM / social media corporate minions. It’s a lot more fun being on the side of skeptical inquiry and dissent than being behind the leaky dike, anxiously trying to stop the actual facts of the matter from entering the public awareness. They talk about meridional circulation (e.g. polar vortex) and a possible link to low solar activity. Here in Canada, the government sponsored CBC, comes with the same stupid story. The “Physical Geography” text books of the early 1960s used the term “arctic outbreak” and described the surface expressions. 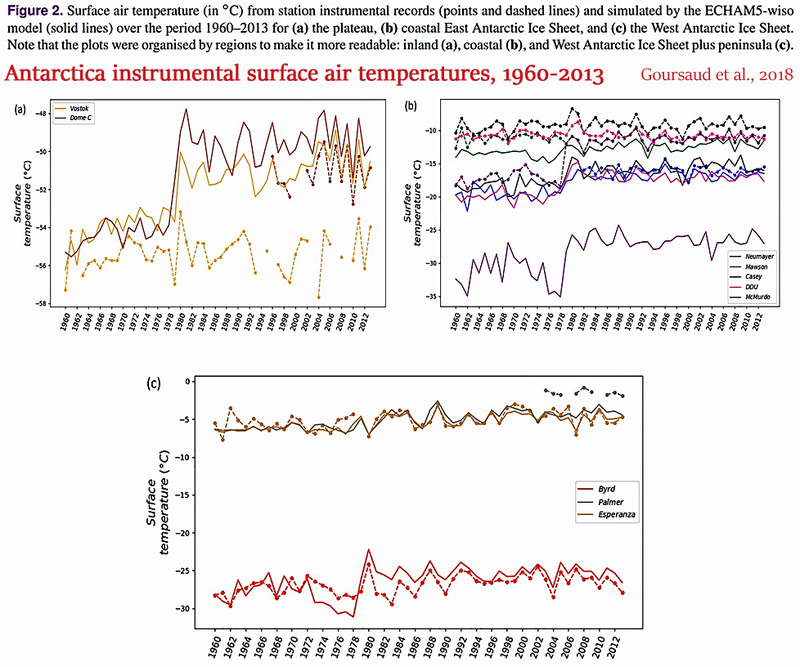 What was happening in the Stratosphere (see: Sudden Stratospheric Warming)did not become clear until satellite and sensor technology came about. So is this fake too? No, not “fake”. Just ordinary. Glaciers have been advancing, melting, calving…for thousands of years. Global sea levels were 2 to 3 meters higher than now about 6,000 years ago, or when there was less ice locked up on land than there is today because surface temperatures at that time were about 4 to 6 degrees C warmer than they are now. 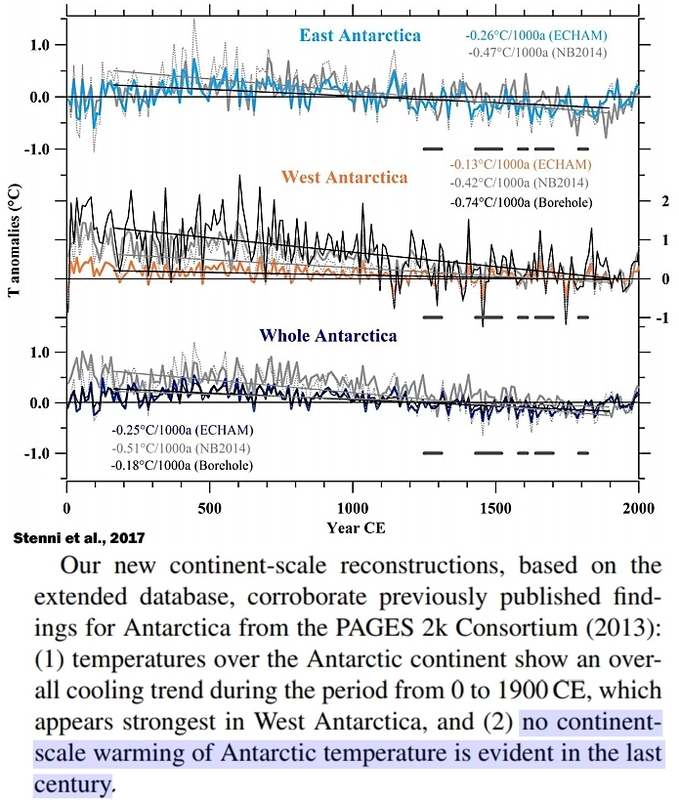 East Antarctica – 2/3rds of the continent – has been cooling as have other regions of the continent (Herbacek et al., 2018; Goursaud et al., 2018) for decades. 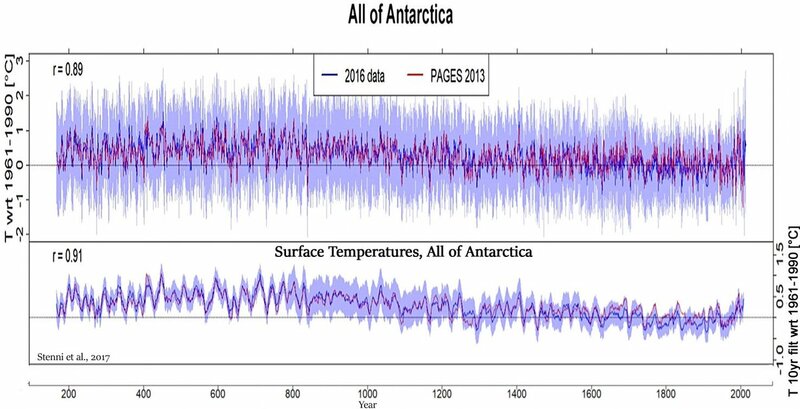 As a whole, there has been no continental-scale warming of Antarctica in the last century, and Antarctica is colder now than it was for most of the last 2,000 years. Further, most of the regions of Antarctica where melting and calving is occurring sits over high geothermal heat flux areas. I hope this information helps with your understanding of the SH cryosphere, P.
LOL. It’s not fake. It just doesn’t prove anything. When all you have is a public school diploma, every problem looks like global warming. every problem looks like global warming. I know several people who have visited Alaska. They come back saying that they could hear the glaciers melting…and this was enough to convince them that, uh, humans caused that and therefore AGW is truth. Hmmm, what could be responsible for the melting-from-below of the Thwaites Glacier that P mentions? Humans melt Antarctic ice by causing volcanoes to erupt beneath vulnerable glaciers. Piers Corbyn uses Solar Lunar activity to predict Vortex. He’s accurate so he must understand the relationship.